In late August, my wife and I spent 8 days camped on the North Rim of the Grand Canyon. On a couple of those days, we took long rides up into southern Utah to see what was there. One of the trips was to Frisco Utah. 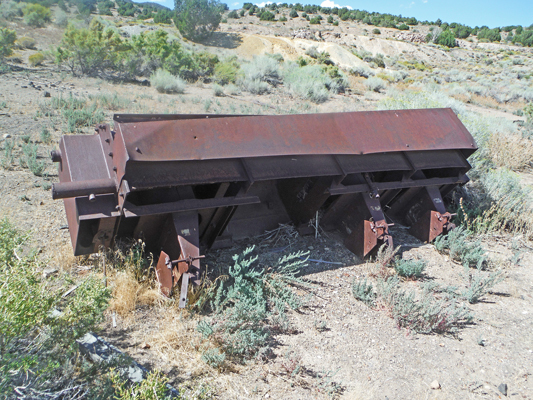 Located along Highway 21 the old town is approximately 15 miles northwest of Milford Utah.
" 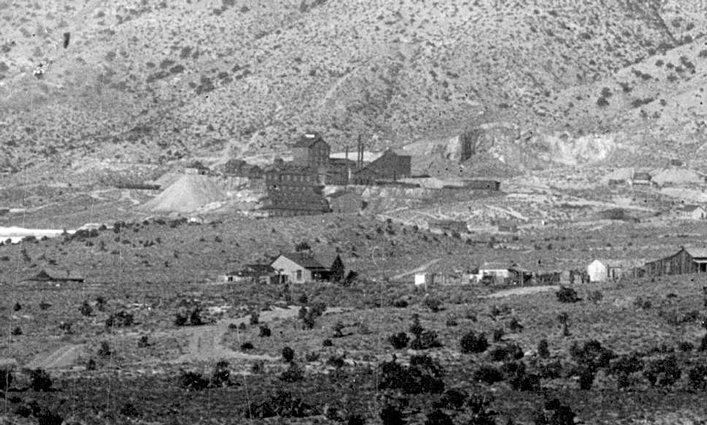 A typical mining town at the foot of the San Francisco mountains was fed by the fabulously rich Horn Silver Mine. By 1885, over $60,000,000 in zinc, copper, lead, silver, and gold were hauled away by mule train, and the Utah Central Railroad. Water was shipped in as well as all supplies. Then the mine caved in and people moved away, leaving only a few families of the 4,000 population to maintain their homes, stores, school and church. By the 1920's only memories and the shifting sands were left". From what I have read since our trip, this statement on the plaque is a sanitized version of Frisco's history. It does not mention the many saloons, active red light district and violence on the streets that all contributed to Frisco's reputation as the wildest camp in Utah. The cave-in occurred in 1885. Poor mining practices led to the collapse of the underground workings. Fortunately, the event occurred between shift changes and there were no fatalities. The mine was partially re-opened after the cave-in, but never returned to full production. 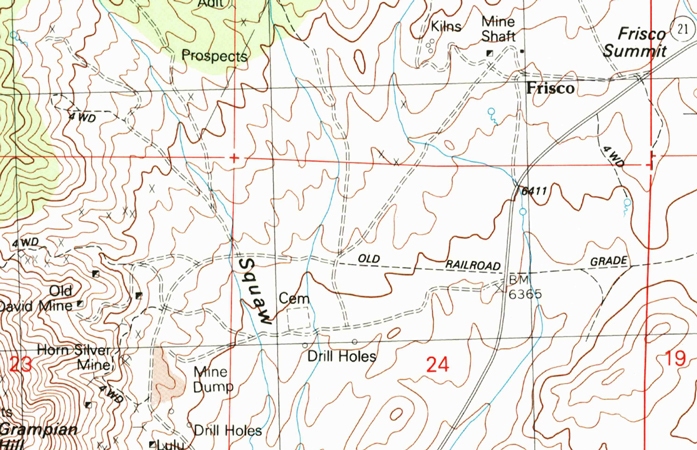 This map shows the relationship between the Horn Silver Mine and the Frisco site. This section of a photo taken in 1908 by the USGS shows the area around the Horn Silver Mine. 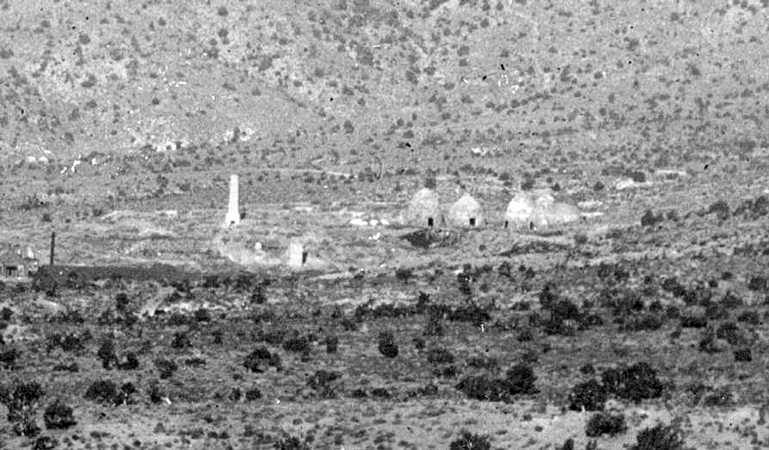 This section of the 1908 photo shows the area around the charcoal kilns. The area that is designated on the topo map as "Frisco" is surprisingly empty. Was the camp re-located to the map location? 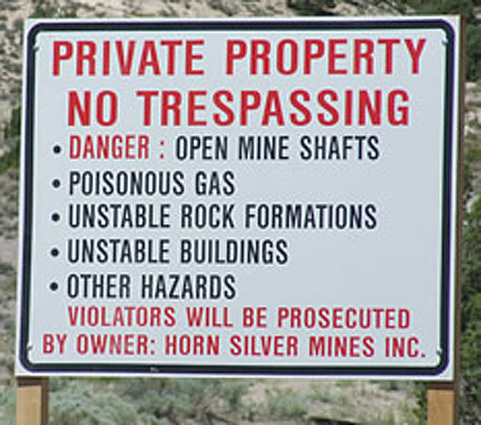 Today, the area around the Horn Silver Mine is posted against entry. Frisco is still accessible. The major features that remain are the 5 charcoal kilns that sit on a hillside overlooking the townsite. 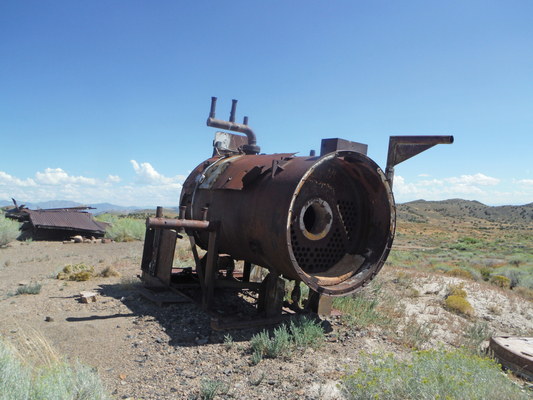 The ovens were used to burn the local pinyon pine and juniper to charcoal. That charcoal was then used as a fuel to fire the furnace at the Frisco smelter. 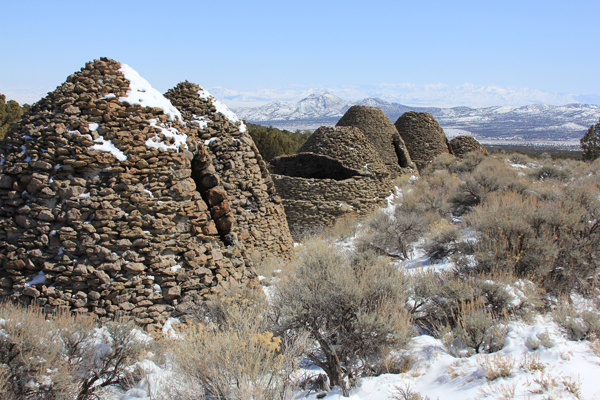 After our trip, I came across a very interesting report that provides quite a bit of information on the Frisco Charcoal Kilns. It is titled "Gallery of Charcoal Kilns", written by Douglas H. Page Jr. and published by the Utah Division of State History. The report can be found here. Mr. Page wrote that the hillside location was probably selected to make it easier to load the kilns through the upper door on the "back" side of the kilns. The heavy soot buildup on the insides of the kilns may indicate that at some point in time coal, rather than wood, was burned in the ovens and converted to coke. Coke is a better fuel than the charcoal. I had noticed a pile of coke near the kilns and had wondered whether it had been produced locally. The five kilns were owned and operated by the mining company. What is very interesting, from the Gallery report, is that there were at least 36 other beehive kilns in the area that also supplied charcoal to the Frisco smelter. Those kilns were independently owned and operated. There were also many pit kilns that produced a lower grade of charcoal. This photo from the link above, shows a set of 7 kilns. 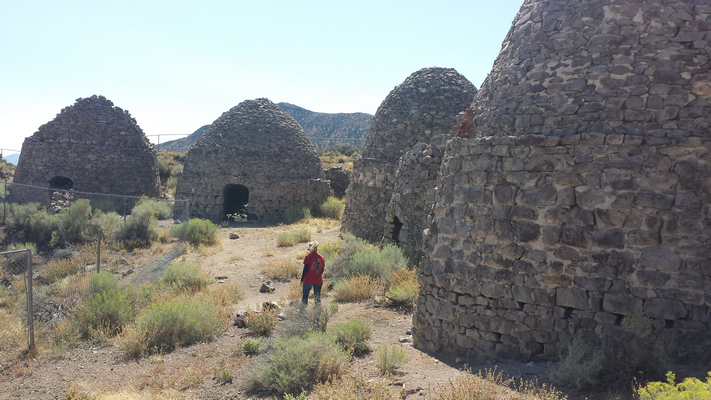 These are the best preserved charcoal kilns in Utah. They are near Frisco and provided fuel for the smelter. There are a few foundations and walls scattered across the town site. 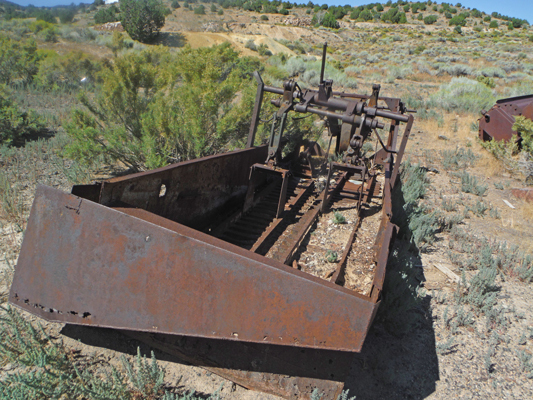 There are several pieces of old mining equipment scattered around. Their placement makes me think that this location may have once been an equipment "boneyard". This appears to be an old compressor. Its keystone logo may indicate that it was manufactured by the Pennsylvania Pump and Compressor Company. If so, that company did not come into existence until 1920. This is not a piece of equipment that would have been used during the early days of the Frisco operation. This ladder or Dorr type classifier would also date to the later years of Frisco's history, sometime after 1900. I did not get the chance to really look over this piece of equipment. My first impressions were that it was some type of flotation equipment. In fairly recent photos posted online, this building was still standing. I am thinking that this was a covered water storage tank. The ties in this roadbed do not match up with the map's placement of the old railroad bed, I am thinking that this was a spur. This abandoned telephone line stands along Highway 21 between Frisco and Milford. We were really disappointed that we were not able to go into the Horn Silver Mine area, but found enough around the kilns to judge that the long trip over from the North Rim of the Grand Canyon had been worth it. If I had known before hand that there were other kilns in the area, I would have budgeted time to see some of those.